Our Troy olympic rubber interlocking bumper plates offer the highest quality at an affordable price. Troy's unique interlocking bumper plate design keeps the bumper plates in place while in use. Troy’s Olympic Rubber Interlocking Bumper plates with stainless steel insert is made with the same demanding specifications as our other TROY products. This plate is quickly out-performing other solid rubber bumper plates on the market. 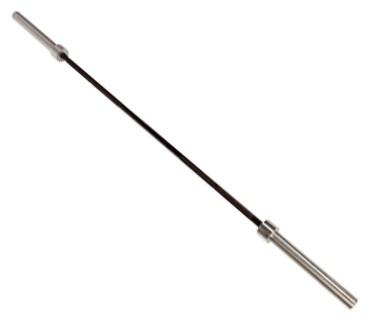 Product Description: By far the strongest bar we sell, this is the original “Texas Power Bar.” The 7’ shaft is coated with black zinc, is 28mm diameter with a 4” center knurling, 150,000 PSI (minimum) 1500 lb. statstical test bar. This bar can be put into any application without worry and is virtually maintenance free. The sleeves are made of one-piece roll pin construction. Perfect for use in a high school or college weight room. 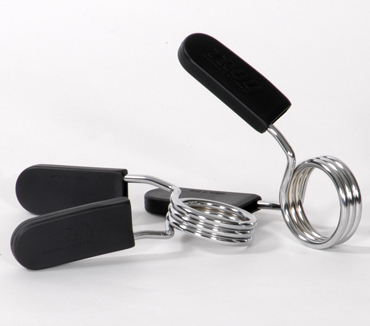 Product Description: Olympic chrome EZ-on Collars with Rubber Grips can securely hold Olympic plates on all 2” bars. 1500 lb. static test competition Power Bar. Deep diamond knurling with 4" center Knurling. Order your Troy Olympic Rubber Interlocking Bumper Plate Set BO-SBP-275 from FitnessZone.com today!